Syz recently posted an image from a gravestone in Beijing. Emblazoned atop the stone was a word in Arabic, written in what is known in Arabic as Sini script (خط صيني) which really just means Chinese script. 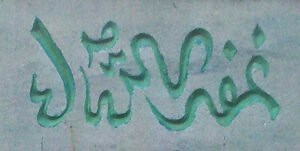 The calligraphic style is found throughout China anywhere Hui Muslims live. It ornaments mosques and memorials as mentioned, but also restaurants and the grill of your local chuarwalla. In the case of Syz’s photo, the script lends a particularly Islamic touch to a gravestone that might otherwise be missed as that of a Muslim. Tourist, n. One who favors packaged over live, who inches squeamishly past the teeming fauna of his own backyard — with its outrageous comedies, its epic contests, its tawdry intrigues — in order to reach the specimen cabinet at his neighbor’s place. I like exploring almost as much as I hate tourism. The recent trip to Sinoglot’s Xiamen office, thankfully, was 80% exploring and only 20% t**rism. Even better, my parents, who have been visiting over the new year, are both more explorers than tourists. So when I take them on a hike in the western hills of Beijing, trying to find “a different trail that I’m sure could get us up to that pagoda,” and we end up on a desolate road squeezed between the base of a hill, abandoned development projects, and some rather weedy graves — they’ll enthusiastically tell me they had a great time. While looking up some obscure thing from Zhuangzi 庄子 this week, I fired up Pleco on my iPod and stumbled across something I liked, though I may be the only one. 燕 yàn means swallow, as in the bird. 嚥 yàn, also written 咽, means swallow, as in what I’m doing with a cold bottle of maibock as I write this. That’s freaking amazing! Or maybe just slightly amazing. Two homophones in English are also homophonous in Mandarin, internal to each language. How often does that happen? Maybe often and I’ve just never noticed. So I thought I’d post it here and see if anyone had other examples of this sort of thing. It reminds me of another interesting but obviously different thing that happens sometimes, which is two words that sound the same in two languages, mean the same thing, but have no etymological connection. For example the word “and” in Arabic is written وَ while Korean has a word meaning “and” written 와. Both are pronounced “wa”. There’s some better example between Japanese and English that I’ve encountered before but I can’t recall what it was. Suggestions of that sort are also welcome. The first word I ever learned to read in Japanese was クラブ, derived from and meaning “club”. There were 5 such Japanese clubs to be passed in my five minute walk to work last year. But my favourite use of foreign languages in a business façade is probably the massage parlour. A number of them say 안마¹, massage and マッサージ², but not always the Mandarin equivalent. Lameen Souag has a post up at his blog Jabal al-Lughat* (hosted on Blogspot and thus blocked in China. Apologies to the proxiless) on efforts to preserve a Berber dialect called Tabeldit or in Arabic Shelha شلحة. One method was the creation of an Arabic-Shelha dictionary. I highly recommend taking a look at the post which bring to the front a common debate on the topic of dialect preservation. Namely, the resistance of protection by the very speakers of the endangered language/dialect.